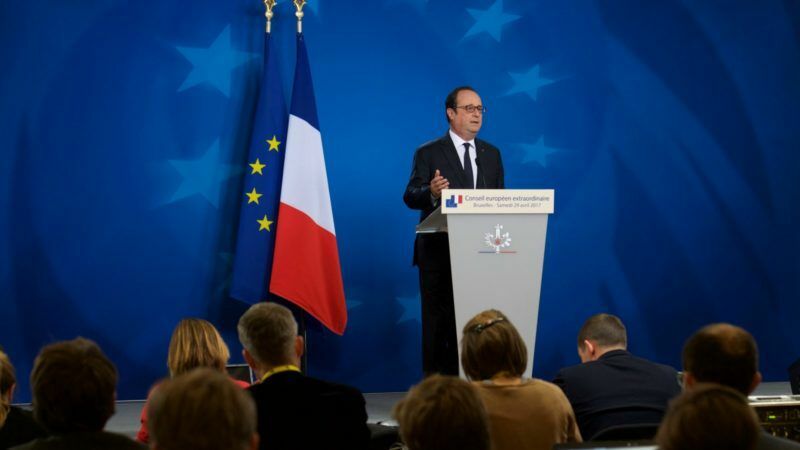 At French President François Hollande’s last press conference at a European summit today (29 April), EURACTIV.com asked the last question: The EU will obviously survive Brexit but could the bloc survive if France takes another course after the second round of the presidential election on 7 May? Hollande said that voters in France must decide their future in Europe in the 7 May presidential vote, which pits Europhile candidate Emmanuel Macron against the anti-EU Marine Le Pen. “Why is the entire Europe looking at France? This was the case before the first round [of the presidential elections on 23 April], it is the case before the second round,” Hollande said. Hollande listed France’s strengths: the country is a founding member of the EU, a member of the Schengen area and the eurozone, the second largest economy in the EU, and will be the only EU member on the UN Security Council and to have nuclear weapons after the UK leaves. He also said that France “represents the history of Europe”, as a country that has fought alongside almost all the other EU member states during the 20th century. “France is so strongly attached to peace because it has seen so many wars. Yes, the consequences would be extremely heavy if France would turn away from Europe. And this is why the choice which is going to be made is a choice for France, but it is also a European choice, which will be expressed by the French people. “I would like to finish here, with this ode to Europe,” Hollande said as his last words, before thanking journalists who he said have been critical, but also attached to Europe. Hollande also commented on Le Pen’s decision today to choose defeated first-round candidate Nicolas Dupont-Aignan as her prime minister, a bid to attract his voters and help her to victory over centrist favourite Macron. Dupont-Aignan is a nationalist whose protectionist economic policies are close to those of Le Pen herself and who, like her, wants to reduce the powers of European Union institutions. He scored 4.7% of votes in the first round of the election and announced on Friday, as widely expected, that he was backing her for the decisive 7 May run-off. He said that both Le Pen and Dupont-Aignan have always advocated for France leaving the eurozone and the EU. “This is why Europeans worry that the French will make the choice which is in their interest, and also in the interest of Europe”. Regarding his relations with German Chancellor Angela Merkel, he said that he didn’t know her before becoming president in 2012, and that they didn’t have “the same sensitivity”. But he added that this did not prevent them from making courageous decisions during the eurozone crisis, managing the Ukraine crisis, or concluding climate agreements. He stressed that the German move toward a defence union had not been easy, and that Germany had shown “a lot of understanding” for the French economic situation. “This French-German relation must continue, irrespective of the leaders”, he said, alluding to the Germany general elections that will take place on 24 September. “Europe at 27, as it was the case at 28, cannot really have confidence in itself if the two main countries are not conscious of the stakes,” he said. “I am sure that Emmanuel Macron will be a good partner for Germany, because he will defend the interests of France, but he also has the conviction that Europe is at the service of our common interests,” he added. Perhaps the French no longer believe the EU Propaganda about voting for EUROPE? Deliberately conflates Europe and the EU. Obviously President Hollande is being dishonest with French voters. The EU has all the charm of a Mafiosa run protection racket. One should not forget that France was the first to vote against the EU constitution several years ago . My guess is that their affection for the EU is even less today . A vote for Macron will not change the people’s view of the EU . The EU is not fully sanctioned by the people of nation states . Getting rid of the Euro would greatly benefit EU economics , not having all the financial eggs in one basket , enabling countries to adjust their currency value as necessary . as for French citizens liking for the EU and Euro, opinion polls (national and Eurobarometer) have consistently and regularly showed their support to both. what they actually complain about is the inability of NATIONAL politicians to actually make the best of it for their own citizens.